The Clare forward was red-carded for colliding with Tipperary selector Shane Stapleton during their recent Division 2 clash. CLARE FORWARD JAMIE Malone will miss his side’s upcoming league games against Down and Roscommon after his two-match ban was upheld by Croke Park last night. 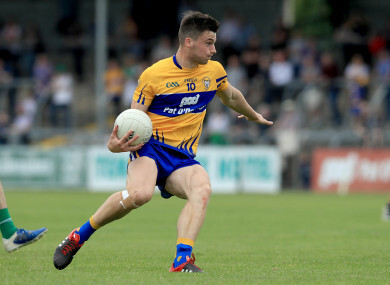 Malone was red-carded during the second-half of Clare’s Division 2 draw with Tipperary 10 days ago after colliding with Premier selector Shane Stapleton. As a result of the sideline collision, Stapleton fell back, hitting his head off the concrete behind him and ended up spending the night in hospital. Clare appealed the suspension, but Clare FM reported last night that his ban has been upheld. Banner manager Colm Collins didn’t appeal his four-week sideline ban for a verbal altercation with a linesman in the aftermath of the Malone incident. Meanwhile, no decision has been made on a proposed three-month ban for Gordon Kelly after an alleged incident with an umpire in the same game. Email “Jamie Malone's two-game suspension appeal rejected after sideline incident”. Feedback on “Jamie Malone's two-game suspension appeal rejected after sideline incident”.